So my challenge this year was to mix it up a little and step away from the comfort of my spinning bike. So when I was asked down to Westway, to trial out a new ‘Bouldercise’ class of course I had to accept. 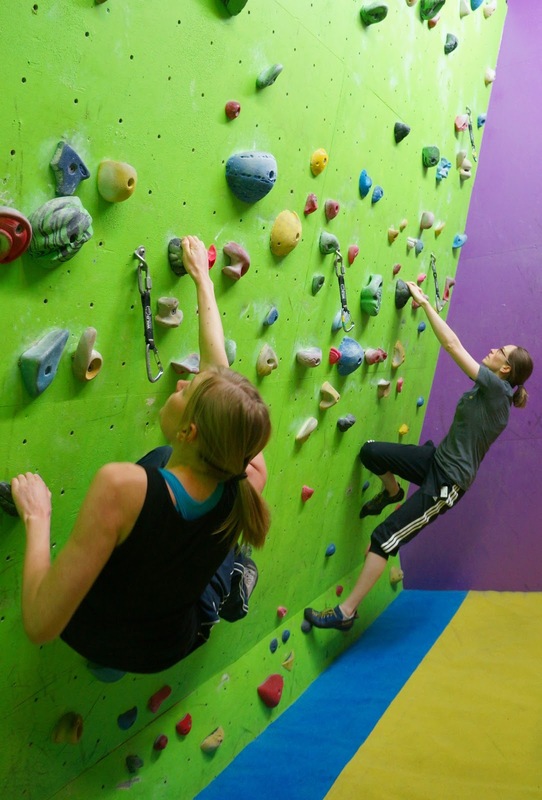 A mix between bouldering and cardio work, it’s one of a kind class especially developed at Westway sports centre in West London. I’d actually had experience of a climbing walls a few years back with an ex boyfriend – lets just say it got competitive. After the initial warm up, which consisted of squats, burpess and climbing vertically across a small climbing wall I got a chance to experience the bouldering wall. Now what I quickly learnt was that bouldering isn’t like a climbing wall – mainly because you have no ropes attached to you. All you had, once you’d climbed up the wall, was a crash mat, in case you decided you couldn’t make it back down again, or you got a bit adventurous and slipped when you tried to place your foot. Me scared? Never! But that quickly vanished from my mind as we walked into the main climbing area – on the wall behind the bouldering there were men, with their tops off, scaling the walls. Why I’d never been here before?! But sorry….back to the bouldering. Now with most things I’m up for the challenge, apart from things like skiing which I know I’d just end up looking worse than Bridget Jones at. A really bad snowboarding lesson reassured me of this. So I was up for being my best at bouldering….but with everyone jumping on the wall and looking like a pro I felt sightly out of my comfort zone. So like any beginner I started with the baby wall, and slowly as I got my confidence (without falling off) and I graduated to the harder climbs (not that hard mind – I’m not a pro yet) – I felt pretty good about it. You’re technically using your body as a weight – and heaving that eight stone whatever up there was pretty tough, but also felt very rewarding too. And….of course I’m going back, purely just to stare at the hot men! Want to give it a go? Bouldercise classes take place at the Westway Sports Centre every Thursday evening and Saturday morning. For more information visit WestWay sport Centre.